Can anyone explain to me why the flash media I play on any of my Web browsers on the Mac is suddenly without sound? Everything else works perfectly, sound-wise, including non-flash streaming media. Can anyone suggest how I can get the sound back on? YouTube just isn’t the same without sound. The computer I bought in 2003 finally died yesterday (I’m writing this on my Mac, to forestall any questions). The computer lasted 3 3/4 years, so I can’t complain too much, but it means that now thanks to my philosophy of “only buy things when you’ve run the previous version into the ground,” I am now able to justify spending money on a new one. I’m treating the monitor as a separate expense, not to be considered in the price here. Also not considering labor costs at the moment. I have a single hard drive at the moment but will be adding the dead computer’s C drive as a slave, which why I have only one in there at the moment. Any thoughts? Anything I should add, subtract, swap out for a better version. I particularly need help with case, power source and cooling. Please note that as regards cases, I don’t need it to look super-bitchin’; functional is a positive. With power source/cooling, quiet is better than not. Also, in terms of gaming/multimedia, I want my performance to be really good, but I’m not going to pay a stupid price premium so that I can crank out 10% more fps. And one question for the true geeks out there: One reason I’m choosing the 975x motherboard here is that it’s my understanding that it’ll support the upcoming Intel Quad Core processors that will be coming out later, and I like the idea of being able to swap out the CPU at some point. Does this jibe with what you’ve heard? Also, the first person who says “Get a Mac!” gets beaten. I already have a Mac and have decided the for the moment the Mac Pro is not how I want to go. Okay, there you have it. Let have your thoughts and comments. And if any of you actually do build computers, I’m not opposed to entertaining bids. 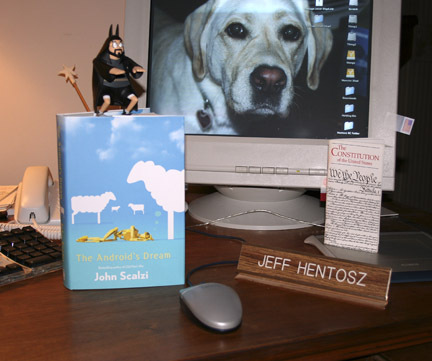 We have our first spotting of The Android’s Dream in the real world: Whatever reader Jeff Hentosz sends along this photo of TAD on his desk (along with his name plate, a Silent Bob figurine, and the US Constitution — yay!). Jeff reports that he got it at the Barnes & Noble at the Easton Town Center in Columbus, which had six copies (now clearly down to five). So if you’re in the Columbus Ohio area and you can’t wait for Halloween (the official release date, don’t you know), then now you know where to go. Remember also that the Easton Town Center B&N is where I’ll be doing a signing/reading/interpretive dance on November 9th, at 7pm. Thanks, Jeff! Anyone else who spots TAD in the wild prior to the official release is likewise invited to send along a photo. Because I’m hungry for reassurance, you see.